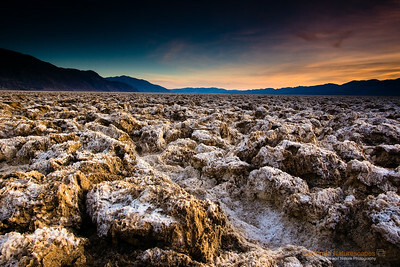 "Salt formations at Devil's Golf Course", Location: Death Valley National Park, California. [Map/GPS] When an ancient lake dried up 10 thousand years ago it left massive salt deposits on the lake bed. The salt and minerals get washed away from the mountains and continue to get deposited in the death valley lake beds even today. This is a late evening picture of the strange landscape with sunset happening behind Panamint mountains. Tech Info and Tip: Lens: Canon EF-S 10-22mm f/3.5-4.5 @ 16mm Camera: Canon EOS 30D Exposure: 0.8 sec at f/20 and ISO 100 Filters: SinghRay 3 stop hard edge ND grad The colors of the landscape here can change so much depending on the time of the day. I first arrived here during mid noon when this particular spot looked dry and dull but when I returned during sunset the rich colors could be captured after using the ND Grad filter. Death Valley has such unique landscape that defies imagination. A visit here is the closest thing to vising an alien landscape. It is one of the most popular locations to photograph. Its badlands, sand dunes, salt pans, strange racetracks offer unique opportunities to capture its beauty. "Badlands of Zabriskie Point" Location: Death Valley National Park, California. 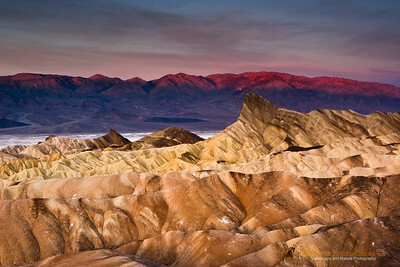 These are eroded badlands of death valley national park seen from Zabriskie point at sunrise. The type of soil and extreme dryness of death valley makes plant life impossible. The hues come from mineral deposits in the soil. The first rays of light at sunrise illuminate the Panamint mountains on the other side of the valley. Tech Info and Tip: Lens: Canon EF 24-70mm f/2.8L @ 38mm Camera: Canon EOS 30D Exposure: 1sec at f/22 and ISO 100 Filters: SinghRay 3 stop hard edge ND grad I have only been here during the month of Dec when the sun rises from behind where I was standing. It looks like a nice vantage point during sunrise possibilities here and endless. Death Valley has such unique landscape that defies imagination. A visit here is the closest thing to vising an alien landscape. It is one of the most popular locations to photograph. Its badlands, sand dunes, salt pans, strange racetracks offer unique opportunities to capture its beauty. 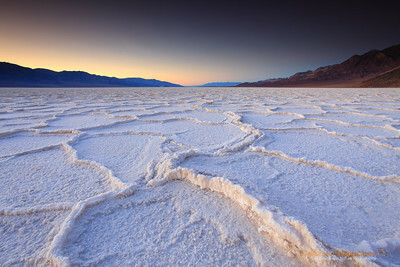 "Saltpans" Location: Badwater Basin, Death Valley National Park, California. A surreal landscape for sure... being here can feel like being on an alien landscape. These are salt deposites left by an ancient lake that once filled this valley. Repeated filling and drying of the lake left huge quantities of minerals, mostly salt, on the lake bed. The unique formation of saltpans is a natural process in which these pans grow and press against each other forming ridges. Tech Info: Lens: Canon EF 17-40mm f/4L @ 17mm Camera: Canon EOS 5D Mk II Exposure: 15sec at f/16 and ISO 50 Filters: LEE ND Grads 0.9 soft edge and 0.75 hard edge Note on post processing: I had to do almost no post processing on this image. The colors are due to twilight glow at dusk. I did, however, had to correct the wide angle distortion that occurs shooting at 17mm focal length with this perspective. Death Valley has such unique landscape that defies imagination. A visit here is the closest thing to vising an alien landscape. It is one of the most popular locations to photograph. Its badlands, sand dunes, salt pans, strange racetracks offer unique opportunities to capture its beauty. 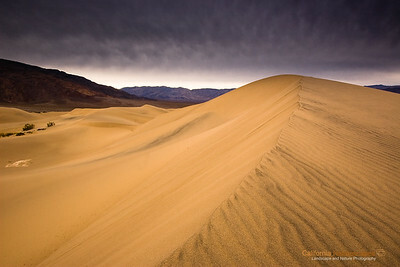 "Mesquite Sand Dunes" Location: Death Valley National Park, California. I always wanted to photograph the lines and patterns that form in sand dunes. So when I visited Death Valley I liked this spot from where sharp edges were looking well with the smooth undulations of the dunes and leading quite nicely to the mountains behind. Tech Info and Tip: Lens: Canon EF 70-200 f/4L IS @ 180mm Camera: Canon EOS 30D Exposure: 1/100sec at f/8 and ISO 100 Filters: No filters I typically prefer not to shoot during mid day lighting conditions, however, this particular shot came out nice even though it was shot during mid day conditions. Death Valley has such unique landscape that defies imagination. A visit here is the closest thing to vising an alien landscape. It is one of the most popular locations to photograph. Its badlands, sand dunes, salt pans, strange racetracks offer unique opportunities to capture its beauty. 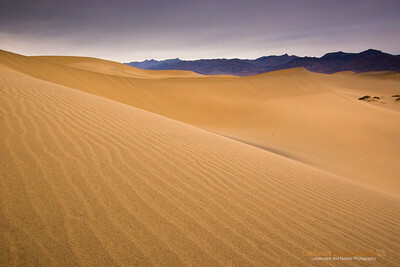 "Mesquite Sand Dunes" Location: Death Valley National Park, California. I always wanted to photograph the lines and patterns that form in sand dunes. So when I visited Death Valley I liked this spot from where sharp edges were looking well with the smooth undulations of the dunes and leading quite nicely to the mountains behind. Tech Info and Tip: Lens: Canon EF 70-200 f/4L IS @ 97mm Camera: Canon EOS 30D Exposure: 1/125sec at f/8 and ISO 100 Filters: No filters I typically prefer not to shoot during mid day lighting conditions, however, this particular shot came out nice even though it was shot during mid day conditions. Death Valley has such unique landscape that defies imagination. A visit here is the closest thing to vising an alien landscape. It is one of the most popular locations to photograph. Its badlands, sand dunes, salt pans, strange racetracks offer unique opportunities to capture its beauty. 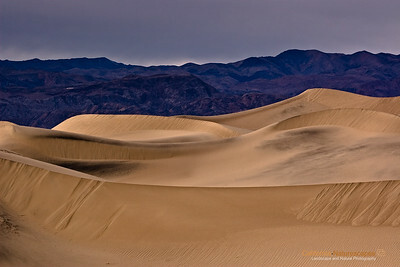 "Mesquite Sand Dunes" Location: Death Valley National Park, California. I always wanted to photograph the lines and patterns that form in sand dunes. So when I visited Death Valley I liked this spot from where sharp edges were looking well with the smooth undulations of the dunes and leading quite nicely to the mountains behind. Tech Info and Tip: Lens: Canon EF 10-22 f/3.5-f/4.5 @ 17mm Camera: Canon EOS 30D Exposure: 1/4sec at f/22 and ISO 100 Filters: SinghRay 3 stop ND Grad Death Valley has such unique landscape that defies imagination. A visit here is the closest thing to vising an alien landscape. It is one of the most popular locations to photograph. Its badlands, sand dunes, salt pans, strange racetracks offer unique opportunities to capture its beauty. 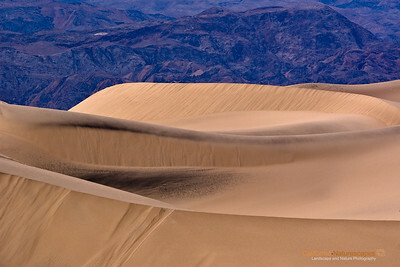 "Mesquite Sand Dunes" Location: Death Valley National Park, California. I always wanted to photograph the lines and patterns that form in sand dunes. So when I visited Death Valley I liked this spot from where sharp edges were looking well with the smooth undulations of the dunes and leading quite nicely to the mountains behind. Tech Info and Tip: Lens: Canon EF 10-22 f/3.5-f/4.5 @ 17mm Camera: Canon EOS 30D Exposure: 1/gsec at f/22 and ISO 100 Filters: SinghRay 3 stop ND Grad Death Valley has such unique landscape that defies imagination. A visit here is the closest thing to vising an alien landscape. It is one of the most popular locations to photograph. Its badlands, sand dunes, salt pans, strange racetracks offer unique opportunities to capture its beauty.